'This card represents fire in its purest, simplest and most unstable form.' It is raw energy, boundless and unlimited. It is the root driving force of all action. The basic drive of the will, which must be carefully focussed and directed. This force motivates new beginnings, ideas and changes. Like any fire it is to be treated with respect and handled carefully lest it become a destructive force or wasteful frustration. 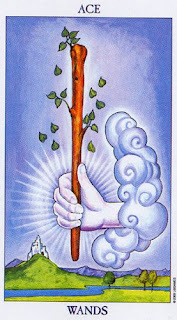 'The Ace of Wands shows that the will of the individual is an immeasurable, powerful force. However, this blind force requires understanding before it may be applied appropriately. The symbol is one of potential but it is totally ambivalent, it may be the drive that goads the scientist to a new discovery, or the despot to seek the position of tyrant, or the healer to find a successful cure. Fire, whether real or symbolic, must be respected and handled with care.' 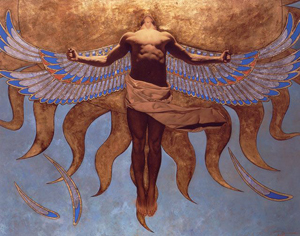 As an example of ‘playing with fire’ and suffering the consequences thereof, we look to Greek mythology where we learn of Icarus, Son of Daedalus who dared to fly too near the sun on wings of feathers and wax. Daedalus had been imprisoned by King Minos of Crete within the walls of his own invention, the Labyrinth. But the great craftsman's genius would not suffer captivity. He made two pairs of wings by adhering feathers to a wooden frame with wax. Giving one pair to his son, he cautioned him that flying too near the sun would cause the wax to melt. But Icarus became ecstatic with the ability to fly and forgot his father's warning. The feathers came loose and Icarus plunged to his death in the sea. Being the first card in the suit of wands that represents the element of Fire, it would be appropriate to read a section from Glennie Kindred’s book ‘The Alchemist’s Journey’ as she writes of the alchemists use and understanding of fire. She says ‘As an alchemist, I seek secret fire, hidden fire or sacred fire, the fire that lives within me and helps me to be in touch with what is truly important for my spiritual journey. I aim to unite my inner fire with my outer fire, so that everything I do in my everyday life, and in the world, is a reflection of this union. 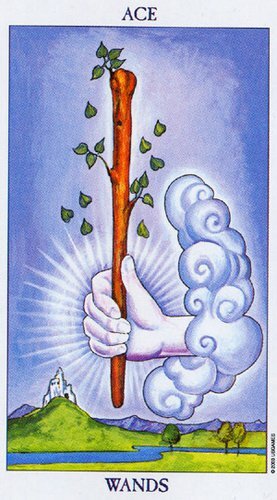 When this card appears to us we might ask whether there are aspects of our lives that we need to fire-up in order to create focus and direction? What projects have we allowed to cool down and stagnate that need to be ignited again so that we can bring them to completion? Is there an aspect of our lives that is in need of transformation? What action do we need to take in order to make necessary changes in our lives? None of these can be successfully addressed without a commitment to action – which is what the element of fire symbolizes. Now may be the time to re-commit and to trust ourselves so that our inner strength and integrity can shine thru as we direct our will in a manner that will transform those elements of our lives that are in need of change. So too is it necessary for us to take responsibility for what we have created. Just as one who builds a fire for warmth needs to take responsibility for it, ensuring that it does not become a raging fire that burns down the forest.